Participants ages 3-17 had use of City Pool for the party. 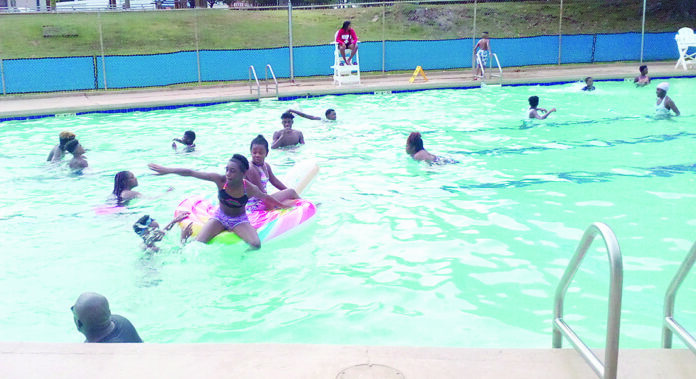 The Block Builders hosted a Back 2 School Pool Party for youth July 27 at the Natchitoches City Pool. Despite the threat of dark clouds and a high chance of rain, the turn out was tremendous. Kids from all over Natchitoches ranging in ages from 3-17 showed up for an entertaining evening. The children were treated to hamburgers, hotdogs, chips and sodas. Thanks to the Block Builders, the children attending the party received free backpacks to help ease the expenses of school supplies needed by all children as they return to school. Abygail Brown, Gabrielle Pickett, Ahaiya Holmes and Tamia Johnson, from left, attended the pool party. Block Builders members are, on front row from left, Algerron Miller and Greg Reed. On back row are Katrina Demars, LaRhonda Brown, Valerie Demars and LeTerrione Eady. Next articleTwins Day edition – over 70 sets of twins featured – On news stands Wednesday afternoon!